Whether there is a temporary Jazz Fest-sized hole in your pocket, or you simply like a good deal, it is easy to dine rather lavishly in any neighborhood in New Orleans for $10 or less per person. Here are some of our favorites for when you’re watching your wallet, but not necessarily your waistline. In 2017, Ericka “Chef Diva” Lassair was the featured celebrity chef for Essence Eats. Her food truck was also recently featured in the hit movie “Girls Trip.” Despite the fame and acclaim, she continues to keep it real, with nothing over $10 on the menu. 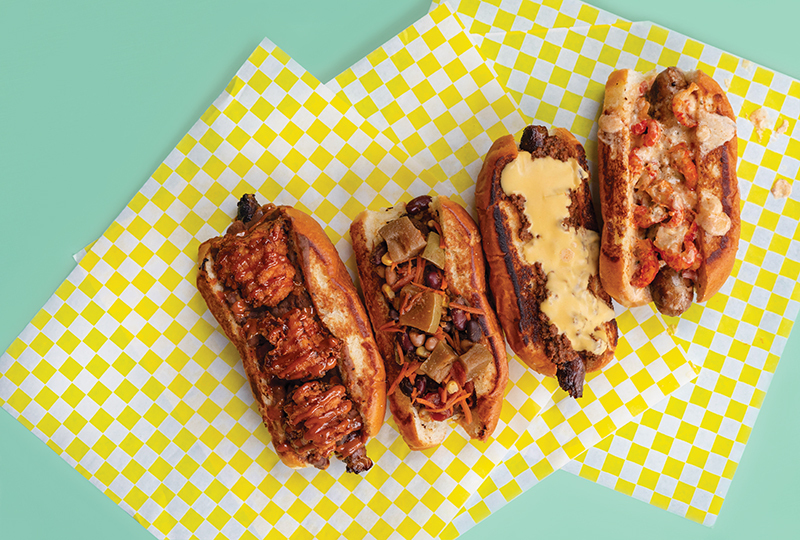 Nine bucks will score a red bean chili dawg (topped w/fried chicken ketchup aioli); a crawfish étouffée chili dawg; a Zapp’s chili cheese dawg; a pepperoni pizza dawg; or a vegan Creole veggie chili dawg. Request the truck for catering or follow on social media: Facebook- fb.com/divadawgtruck; Instagram- @divadawgtruck; Twitter- @divadawgtruck, divadawgtruck.com. On weekdays from 11 a.m. to midnight. a massive slice of cheese pizza will satisfy anyone for $3, pepperoni for $3.50, and the daily special for $4. The chicken Parmesan sandwich is also a bargain at $7.50. 4400 Banks St., 483-8609, midcitypizza.com. This happy breakfast and lunch spot is adorned with bright murals and vintage toys, and your meal may arrive on the sort of plastic, compartmentalized “plate” most often associated with school cafeterias. Options trend toward the unexpected. Try the deviled egg tostada ($6.50) marrying Cotija cheese whipped with a rich egg mousse, and topped with refried red beans, chopped cilantro, lime, red onions, pickled peppers and peanut salsa. The portion, while not gigantic, is bursting with exciting flavors that will keep you satisfied for hours. 2368 Magazine St., 302-1896, mollysriseandshine.com. Juan’s first “lit up” on a really funky stretch of Lower Magazine Street in early 1997. The menu is trippy and fun, and the atmostphere even more so, attracting a clientele inspired to do the same. Though most items on the menu ring in under $10, Tuesdays bring the ultimate Bargain Betty with $2 street style tacos. Choose from Machaca beef debris, adobo chicken, or tofu. Each is served on a white corn tortilla with cilantro, diced white onions, and Cotija cheese. 2018 Magazine St., 569-0000, 5538 Magazine St., 897-4800, 515 Baronne St., 529-5825, 4724 S. Carrollton Ave., 486-9950, juansflyingburrito.com. Order a Numero Tres and two can eat abundantly for $16.75. Selections allow for customizing the platter—which comes with rice, beans and a grilled chicken salad—but the combination of a shrimp flauta, bean burrito, and shrimp, fried fish, and chorizo tacos delivers the best of the best. 5932 Magazine St., 897-3974, taqueriacorona.com. The German-centric menu here is loaded with cheap-eat options. Cobble together two or three of the $4 sides, including spatzle with gravy, warm German potato salad, and crawfish remoulade slaw, or share an order of the divine Flammkuchen (thin, crispy German flatbread with caramelized onions, smoked bacon, cured ham, and cool and creamy crème fraiche) for $9. 617-B, Piety St., 301-3222, bratzyall.com. Though most often associated with hefty sandwiches running from $10.50 to $12.50 , fantastic bargains for under $10 are also available. Try the ethereal fried chicken skins and deviled eggs for $6, or the fried pot pie stuffed with slow cooked chicken and a side of tarragon buttermilk dipping sauce for $7.50. 739 Jackson Ave., 218-7428, turkeyandthewolf.com. The humblest of places, located in an Uptown residential neighborhood where it is joyfully misplaced, in addition to chips, candy, booze and cigarettes, exceptional poor boys (try the Korean BBQ pork) and amazing Vietnamese food are on offer. Try the pork sliders on steamed buns, a killer bargain (4 for 7.99). 7446 Garfield St., 866-4741, singletonspoboys.com. This soothing plant-based retreat is operated by brothers Goshi and Deshi Berg based on the non-violent principals of Ahimsa, followed by the Hare Krishna community. Most items, all of them bright and fresh, are under $10. For breakfast, try the Upma ($5.99), a traditional Southeast Indian porridge served with fresh coconut chutney. For lunch consider the avocado sandwich ($9.99) combining slices of perfectly ripe avocado, tomato, vegan mayonnaise, cucumber, fresh lettuce and almond spread on toasted Bellegarde Bakery bread. 2940 Canal St., 401-4698, goodkarmanola.com. If you seek satisfying soul food made with love, this cozy spot in the shadow of the airport delivers. Each day brings a fresh plate lunch for under $10, and any day may bring slow-cooked red or white beans with hunks of ham, roasted pork ribs, smothered chicken, smothered okra, stuffed bell peppers, fried catfish or seafood stew. You can’t go wrong here. 2000 Airline Dr., Kenner, 305-0339. A classic upscale steakhouse in Old Gretna since 1963, the dinner menu here brings the prices one would expect in such a setting, but the weekday lunch specials bring two-course meals of stunningly high quality for $10.95. Choose from a starter of excellent turtle soup, seafood gumbo, soup of the day, or a fresh salad, followed by six entrees that include slow-cooked boiled beef brisket with cabbage, carrots, new potatoes, and horseradish sauce; and a boneless pork rib-eye glazed with Steen’s cane syrup and fig reduction with yam mash, and haricots verts. 1036 Lafayette St., Gretna, 367-0935, theredmaple.com. If you are looking to fill up and fuel up on the cheap before hitting Jazz Fest, this nearby cafe with outdoor seating is your spot. Nothing on the menu tops $8. Check out the sausage roll made with Terranova’s smoked sausage and served with housemade tomato relish for $5. 1430 N. Dorgenois St., 644-4178, pagodacafe.net. Though named for Vietnamese chicken noodle soup (pho ga) Mi Vit Tiem is the dish that will leave you craving absolutely nothing. Thin egg noodles are pooled in a satisfying umami-rich broth with dark mushrooms and a roasted leg quarter of duck with glistening dark skin. This bowl of bliss will set you back $9.95. 2651 Barataria Blvd., Marerro, 347-3553. The first Toast location was opened in 2014 by Cara and Evan Benson. Now with three locations (including one right near the Fair Grounds so you can get your fill before heading through the Jazz Fest gate) each serves as a neighborhood bakery and coffeehouse. A few things on the menu head north of $10 so it is easy to stay in a tight budget. For only $4, order toast and an egg cooked your way for a thrifty and satisfying start. 5433 Laurel St., 267-3260, 1845 Gentilly Blvd., 351-3664, 1035 Decatur St., 300-5518, toastneworleans.com. Here familiar Louisiana dishes are recreated with refined technique and a focus on Gulf seafood, Cajun flavors, and fresh seasonal produce. For a thrifty brunch in a rather high tone place, cobble together crab boil potato hash ($6) and a buttermilk biscuit with pimento cheese ($6) for or pick a couple of sides from the Lagniappe menu. 8201 Oak St. #1, 518-6889, dtbnola.com. This Carrollton Avenue spot offers authentic renditions of dishes from the state of Veracruz, along Mexico’s Gulf coast. Seafood is the star at this humble and homey spot but a recent breakfast of Huevos con Jamon (scrambled eggs with ham and fresh Cojita cheese) was so utterly delicious and inexpensive ($6.25 for a heaping plate with a pile of just-made tortillas) as to have rendered the meal unforgettable. 1434 S. Carrollton Ave., 281-4127, panchitasmenu.com. I am hopelessly addicted to their avocado fries (wedges of perfectly ripe avocado battered in some light, magical tempura-like coating, quickly fried to a greaseless perfection and served with a magic potion/sauce) and the Seoul Man tacos (Bulgogi Chicken, shredded cabbage, cilantro, pickled red onions, and Sriracha aioli on flour tortillas) that come two to an order for $6. Check out their Facebook page for a listing of where to find them next, facebook.com/Taceaux-Loceaux. and crema that you fold in half to eat without utensils) and you will be full all day long for under $4. Los Catrachos 2, 3001 Tulane Ave., 510-2890. Grab a dining companion and share a Media Noche (Midnight Special) sandwich stuffed with roasted pork, ham, Swiss cheese and tangy pickles stuffed between two pieces of vaguely sweet, eggy bread pressed to crisp perfection. Add a side of black beans and yucca and you are out the door for around $10 per person. 4200 Magazine St., 827-1398. Chef Dan Esses rose to local prominence with Three Muses restaurant in the Marigny, then decamped to open in Tulane University’s Hillel Center, which serves the Jewish community. Open to all, the restaurant serves up seasonal, farm-to-table, healthy and Kosher foods for breakfast, lunch and dinner. For a healthy, fresh, filling option on the cheap, try the beet and Brussels sprout salad (local greens, pickled red onions, beets, Brussels sprouts, apple butter vinaigrette) for $8.50. Other dishes here showcase Esses’ international culinary talent and rove through vegetarian, vegan, French, Korean, Jewish and Israeli cuisines. 912 Broadway St., 232-0758, rimontulanehillel.com. Head to the back of the market to the steam table for unforgettable carne asada, yellow rice, roasted pork loin, crisp fried fish, grilled chicken, and chicken mole. Nothing is over $10. Whip up some sangria and have a party. 250 S. Broad St., 822-8861; idealmarket.com, for additional locations in Metairie, Kenner, and Gretna. Now with two cozy locations (Uptown and Mid City) these hipster hotspots offer contemporary, including vegan, options for breakfast and lunch. To keep hunger at bay all day, try the Gravy Train, two fluffy biscuits smothered in sausage cream gravy served with bacon and eggs for $9. 4408 Banks St., 252-0343, wakinbakin.com. The addictive, crisp on the outside, tender on the inside buttermilk drops are the draw here, and you should have a couple, but you would be a fool to pass on the breakfast platter with fried catfish for $5.50. 1781 N. Dorgenois St., 252-4538, buttermilkdrop.com. The first to cater to the emerging trend of vegan soul food, carnivores will not miss a thing at this Treme hotspot. The colorful cafeteria-style joint turns out fresh takes on New Orleans classics like red beans and rice on Mondays and crispy fried chickpea cakes instead of fried catfish on Fridays. The menu changes daily and the portions are hefty so sharing is the way to go. 1016 N. Broad St., 821-2669, sweetvegansoulfood.com. Housed in a low-slung purple building in Treme, you are obliged to place your order at a bulletproof glass window within. No worries, you will have plenty of company and even massive catering-sized orders roll up magically fast. The fried wings are addictive ($5.39 for 8 plus a side of fries or shrimp fried rice and a side salad) and the yakamein ($5.49) is spot on, too. 1782 N. Dorgenois St., 948-2556, manchu-kitchen.com. The style here is thin crust New York, but the restaurant uses a French style dough for a bit of New Orleans flair. For the ultimate bargain head in for the Pint and a Slice Special: $5 for a slice with one toping, and a choice of 6 beers—mainstream, craft, and imported—on draft. 4418 Magazine St., 891-2376, newyorkpizzanola.com. The line within is always impressive as people wait patiently for excellent carved-to-order gyro meat piled up on hefty sandwiches. The chicken shawarma plate is also fresh and plentiful. Two can dine lavishly for $20. If trying to romance your dining companion, forgo one of the outdoor tables adjacent to the pumps where others are filling their cars with high octane. 3720 Magazine St., 269-6427, shawarmaonthego.com. The menu changes daily at this real deal soul food restaurant where turkey necks and turkey wings, chitterlings, neck bones, beans and greens, smothered chicken and smothered okra, rice and gravy, and cornbread and cabbage rule the day. Gumbo comes with a choice of rice or potato salad and gravy thickened with roux comes on just about everything. Few things ring in over $10. 9901 Chef Menteur Hwy., 242-0469. On a recent visit for $23, two of us had a meal that was packed home to easily feed six. There is a 20-minute wait for a four-piece order of perfectly executed fried chicken. It is worth the wait and comes with a side of whatever “vegetable” you choose. Go for the eggplant dressing, which is really more about meat. If you are seriously broke get the “small” (ha, ha) macaroni and cheese and ask them to ladle it over with red gravy for $4. 613 W. St. Bernard Hwy., Chalmette, 279-8323. 325 S. Broad Ave., 301-9171. 2239 St. Claude Ave., 295-7021. 509 S. Carrollton Ave., 866-9104. 3442 St. Charles Ave., 895-0858. 91 French Market Pl., 522-5851. 2227 St. Claude Ave., 265-8855.